Page 11 of The Mythic Roots of Western Culture’s Alienation from Nature. Adams and Belasco. Tapestry Institute Occasional Papers, Volume 1, Number 3. July, 2015. Outline / List of Headings available here. The woodcutter who rescued Little Red Riding Hood with his ax has much older roots than might be guessed. Jakob and Wilhelm Grimm published collections of German folk tales between 1812 and 1818 (46), though of course those stories had been passed down orally for generations before. But the first written record of a Hero with an ax — who uses it to slay a monster and then cut down a monumentally large tree — is literally the oldest written story in Western culture: The Epic of Gilgamesh. This popular story has been found on numerous clay tablets from different time periods, the oldest of which date to about 2100 BCE, more than 4,000 years ago. That makes the written version of this story a full thousand years older than estimates for written texts of either the Iliad or the Bible. The epic tells of the super-human exploits of the Sumerian king Gilgamesh, who actually ruled the historical Mesopotamian city of Uruk around 2750 BCE (47). “[Gilgamesh] built the wall of Uruk-Haven, . . . The most commonly translated version of The Epic of Gilgamesh occupies 11 separate clay tablets and the description of Uruk occurs at the very beginning of the first one. So from the outset, this oldest written story — told and recorded in the very culture, time, and place that gave birth to Western culture (50) — exhibits one of the main elements of the Fiery Desert, Dark Forest Myth: a walled fortress city. But of course it isn’t long before Gilgamesh leaves the safety of Uruk’s walls and heads out into the wilderness on a series of Heroic adventures. On the first of these, he makes a special ax, goes into a sacred Dark Forest, and cuts down the biggest tree there. The oldest written expression of the Dark Forest, Fiery Desert Myth in existence, The Epic of Gilgamesh reveals people’s mythic view of nature in the time, place, and culture that are the root source of Western culture itself. It is therefore a Rosetta stone that unlocks the mystery of how and why people of Western culture think about nature the way they do. Because it’s so important but few people are familiar with it, we will summarize the story first by focusing on its two main characters Gilgamesh and Enkidu, and then analyze the story’s rich layers of structural elements. 46. Ashliman, D. L. 2013. “Grimm Brothers’ Homepage” at the University of Pittsburg website. Available online at http://www.pitt.edu/~dash/grimm.html. 47. Stephen Mitchell. 2004. Gilgamesh: A New English Version. Free Press, A Division of Simon & Schuster, Inc. New York, NY., pages 1-3. Most scholarly attention on The Epic of Gilgamesh has focused on this story’s early expression of the Hero’s Journey Myth, the role of women in the story, and the intimate view of Sumerian culture the story reveals. However, a lengthy flood story in the last few tablets so closely parallels the Genesis story of “Noah and the Ark” that it drew great attention when the epic was first translated (Mitchell, Op. cit., pp. 1-6). 48. 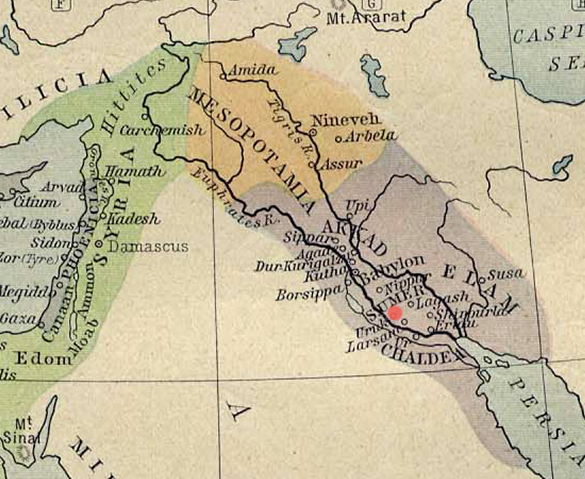 “Mycenian Greece and the Orient about 1450 B.C.” Historical Atlas by William Shepherd, 1926 ed., p.4. University of Texas Map Library. Available at http://www.lib.utexas.edu/maps/historical/shepherd/mycenean_greece_orient.jpg. Accessed July 2, 2015. 49. The Epic of Gilgamesh, Tablet I. Translated by Maureen Gallery Kovacs, Electronic Edition by Wolf Carnahan, 1998. Available online at http://www.ancienttexts.org/library/mesopotamian/gilgamesh/tab1.htm.